Would you like to use your position as a business owner to do some real good in your community, and help yourself at the same time? It's always good business to reach out to customers, but unfortunately there are some sections of society which never seem to get the attention and help they need. Many elderly and disabled people find it physically difficult or even impossible to access the local amenities they need day to day, and other social groups find their access is limited by prejudice and discrimination. These people stand to benefit considerably from a well targeted business enterprise which understands their needs. They want to participate like anyone else, and if you can help them to do so then you can open up a whole new market for yourself. Issues surrounding accessibility are more complex than many people realise, but many small businesses don't even provide the basics, and it's easy to make a big difference with relatively little effort. You can start by making sure that floor space within your business is clear of obstructions and is at least three feet wide at all points. This matters even if you're upstairs with no lift, as wheelchair users may not be able to reach you but stick users and blind people still need consideration. If you have a toilet for the public, make sure the room is large enough and provide handrails and an emergency cord. 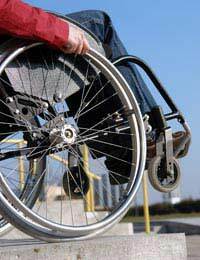 If there are just one or two steps up to your door, provide a ramp - if you use a temporary one, make sure there's an obvious bell at a suitable height for wheelchair users to ring when they need it. Try to place your most popular items on medium-height shelves and if you work from behind a desk, provide another option for customers who can't see over it. Using a ticketed system for queues, with seating available, is a great help to customers who find it hard to stand. Above all, make sure you (and your staff) pay attention and are ready to help when a customer is experiencing difficulty. Remember that disabled customers may not look disabled in the ways you expect, and customers whom you see managing well one day may have health conditions which make things difficult for them on another day. By working with other businesses you can also make larger scale improvements such as installing a lift in your building or providing a bench in the street outside - something which can make all the difference to people who find getting around exhausting. You can lobby your local council to improve street lighting and the condition of pavements, and you can work with charities to identify the major access issues in your community. No matter how hard you try to make your business accessible to everyone in your community, some people will never be able to reach it themselves. Charities can help you to identify people who are housebound. Such people welcome a business enterprise which takes their needs into account, so it can be well worth your while to offer a special home visit or delivery service, perhaps after your premises have closed for the day. Unfortunately, in any community, there are people who are not physically excluded from participation but who feel excluded because they are used to being treated with hostility. This can often happen to them on business premises as well as in society at large, with business owners failing to understand how much they too stand to lose as a result. These people may be from minority racial or ethnic groups, they may have minority sexualities, they may be transgendered, they may be from religious minorities or they may belong to politically vulnerable groups such as benefit recipients or single mothers. Often young people involved in particular subcultures feel similarly excluded, and sometimes the vulnerable people are not in a minority in society at all, but expect to be in a minority amongst your customers, such as women using a hardware store. How can you help them to feel welcome and demonstrate that you're keen to do business with the whole community? The most important factor is your staff. Make sure they're well trained and are aware of the things which particular groups might find offensive; make sure they don't exhibit prejudice which they've simply picked up by habit, without thinking. Encourage them to put friendliness first. You should also look at your advertising, including posters on your premises. Is it truly representative of the community you work in? Making an effort to identify and understand disenfranchised people in your community can make a huge positive difference for all involved, and it can mark you out as a business which cares.